AshleyNewell.me: More VSN and Happy Birthday Unity! More VSN and Happy Birthday Unity! I have a couple more cards that I made at VSN to share today. Remember, you have until 10pm tonight to make cards for VSN mini and get entered to win a prize! Woohoo! How awesome is that? This first one is for Carole's challenge. The challenge was to be inspired by one of the Beatle's songs from the show LOVE. You can find the challenge HERE. I was inspired by the song I Want To Hold Your Hand. I used an image for Unity's April KOTM. I really wanted to use pink since Carole loves pink! And of course, I love pink and brown. The DP is SU, the ribbon is American Crafts, and I added Primas, a brad, and some Stickles. The next card was made for Jen's strip challenge. She challenged us to use strips to paper on our card. You can find her challenge HERE. This was quite the challenge for me since I don't like to measure and make sure everything is straight and tidy. I know, from a CAS card maker, isn't that shocking?? 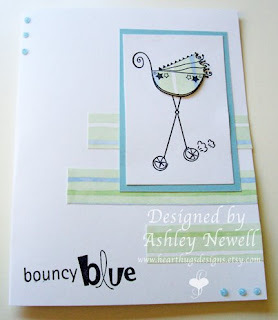 I made this card with Unity's Bouncy Blue which the AMAZING Lynn Warner sent to me for winning a RAK on her blog. She's the sweetest! She sent me a bunch of stuff! On this card, I made the strips and used the same paper to paper piece the stroller. 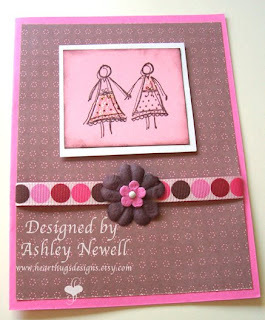 I just stamped the sentiment directly on the card base and added some Stickles. Super easy peasy! And speaking of Unity, (I used ALL Unity on these cards) they are celebrating their first birthday this week! Woohoo! It's so fun! Check out the Unity Blog for all the amazing details! There's gonna be challenges, games, and prizes galore! Hi Ashley!! I love your cards!! I love the girls holding hands. So cute! What an adorable baby card! Isn't it fun to get happy mail. Can't wait to see your Flutter By Creation on Wednesday. I finished mine today. These are so nice! I really like the first one, so nice! Somehow I missed these! They are beautiful! I love what you did with them!